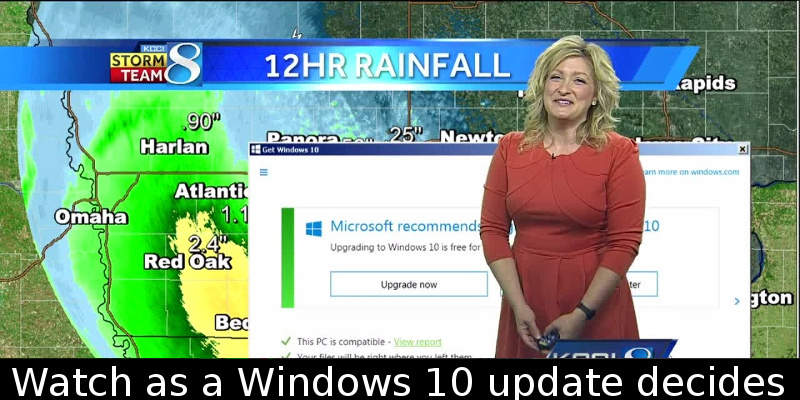 Watch the hilarious reaction of a news reporter as her weather cast report gets interrupted by a random and unexpected Windows 10 update. Microsoft has been driving you crazy with Windows 10 updates ever since the new operating system came out back in 2015. The tech giant has been forcing the update onto its clients in a variety of extremely annoying pop-ups that urge users to update their devices to the new Windows version. If you’re one of those people, who have been evading the update for an entire year, then you’re probably used to seeing the forced update pop-up messages and instead of getting annoyed by them as much as you used to, you’ve just grown used to ignoring them. And it should come to no surprise that you’re not the only one! A news reporter got the update pop-up at the most inconvenient moment possible – during her weather report on live TV. And guess what she did about it? 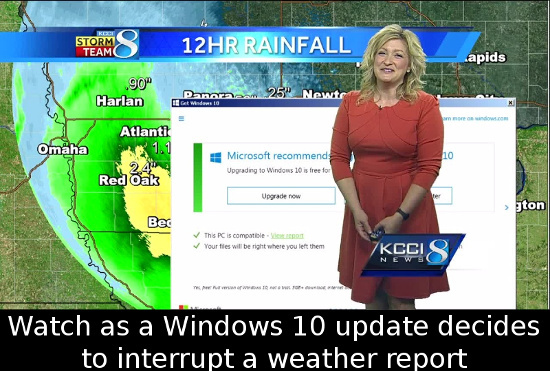 Metinka Slater was presenting the weather report on KCCI News and was explaining about the 12 hour long rainfall over some parts of the state of Iowa when the Windows 10 update interrupted her and took over most of her screen. The reporter decided to ignore the update, switched her screen and kept on going with the rest of her script. She did sarcastically state that she “loves” those constant update pop-ups Microsoft delivers in the most unexpected and inconvenient of times, and after she finished her report she jokingly said how all KCCI News viewers were probably saying “don’t do it” at that exact same moment. And there you have it – even the news reporters are telling you to keep ignoring those pop-ups and to not update to Windows 10 regardless of Microsoft’s constant reminders!